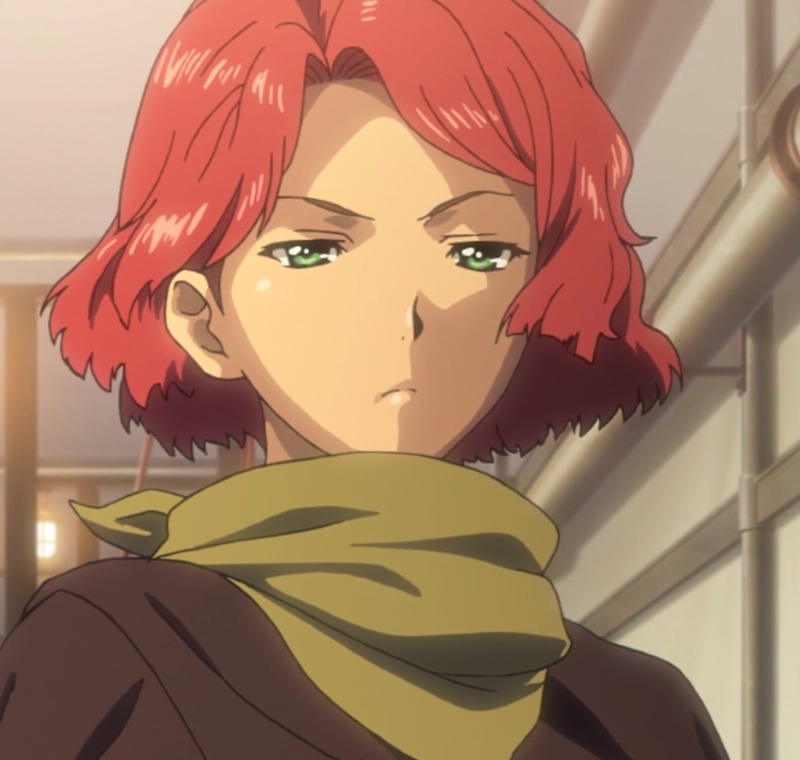 In “The Attacking Weak,” Kabaneri of the Iron Fortress‘ 10th episode, Ikoma, Kibito, Takumi, and others plot an uprising; we find out what Biba Amatori’s using the crew of the Koutetsujou for; Mumei still holds out some trust and hope in Biba; things get really dark at the end. Really dark. Like, really, really, really dark. Interested in Kabaneri merchandise? Amazon has some great stuff. Check it out! Ikoma, held in a cage among the other captives from the Koutetsujou, watches, waits, and plans. Capture from the Amazon Prime Stream. Ikoma, held in a cage among the other captives from the Koutetsujou, carefully watches the guards and their equipment to plan an uprising. Sukari appears to have gone over to the enemy and helps distribute food to his old friends. Most call him a traitor, but he only seems affected by Yukina’s expression of disgust when he hands her a vial of blood for Ikoma. The captives have different color arm bands. Just after they eat, a different color of band each day must “donate” blood to feed Biba’s Kabane horde. As Takumi waits while his blood drains, another man asks to give extra to cover for his wife. 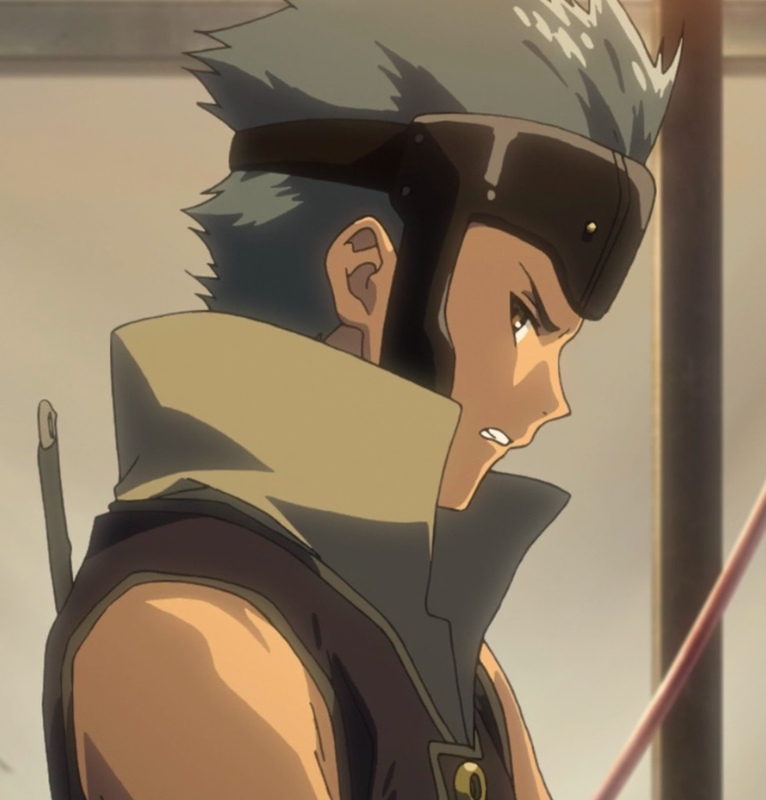 Uryuu, one of the Hunters who has blue/gray hair, says it’s okay, but another Hunter, Warabi, objects. As the man tries to bargain, Warabi hacks off the husband’s arm. Takumi is barely able to contain himself. When he finishes giving blood, he goes back to Ikoma and says he can’t take much more. Ikoma announces they’ll be ready tomorrow night. Biba asks Ayame to help him get a face to face meeting with the shogun. He says he’ll guarantee the safety of her people if she helps him. What will she decide to do? That night, they begin their uprising under Ikoma and Kibito’s leadership. 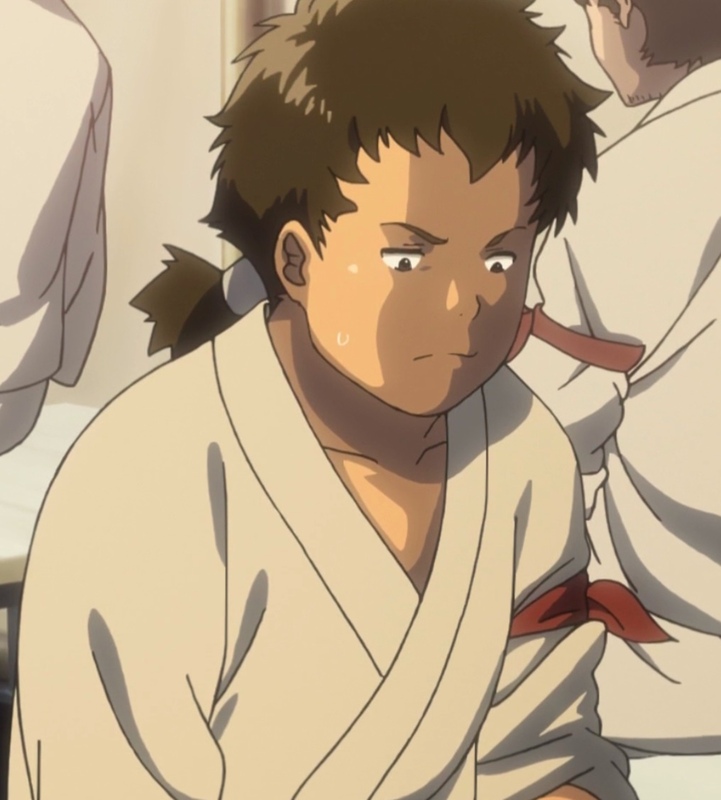 They initially make good progress, but Biba has plans of his own, and they involve Mumei. Will Warabi get what’s coming to him? Will Mumei break free of Biba’s influence? Will Ikoma and Takumi take control of the Kokujou and take a break to have a filling meal? Biba’s Hayajiro, the Kokujou, is on the way to the shogun in Kongoukaku. The Koutetsujou is in tow. Ikoma is in a cage so small that he can’t stand up. Otherwise, he’s in the same car as many of the other captives from the Koutetsujou. Some of the men and women wear a red arm band; some green; others yellow or black. When it comes time to feed everyone, Sukari is helping distribute food. He’s despised as a traitor, but he makes sure to give Yukina a bamboo vial of blood for Ikoma. He seems genuinely distressed at her obvious disgust at his affiliation. The captors tells those with red arm bands to go to the next car. Takumi is one of those with a red arm band. Takumi and the others from the Koutetsujou are forced to give blood to feed Biba’s Kabane. Capture from the Amazon Prime Stream. Ikoma, sitting in his cage, notes the captor’s leader and his keys. Ikoma uses a nail to make a mark on the floor. In the other car, Takumi sees the captors from the Kokujou draining blood from the captives — apparently to feed the Kabane horde. As Takumi reluctantly “donates” his blood, a captive asks for mercy on his wife. She’s sick, and he’s afraid that draining her blood will push her too far. Uryuu, one of the Hunters who had wanted to use Kurusu’s sword to kill a bug in an earlier episode, says it’s no problem. Another Hunter, Warabi, apparently more enamored of Biba’s philosophy, strings the man along until he offers to shake hands; then the captor hacks the man’s arm off. Uryuu is disgusted at the gratuitous violence, but he doesn’t stop it. When he’s done giving blood, Takumi returns to the car with Ikoma’s cage. He asks when they’re going to execute Ikoma’s plan; Takumi can’t take much more. Ikoma says tomorrow night, when the captors come to take blood. Biba invites Ayame to tea. He promises to not butcher her crew if she agrees to help him get an audience with the shogun. Not seeing any other reasonable choice, she agrees. When she asks why he wants to meet the shogun, he answers that 10 years ago, when he was still a child (about the same age Mumei is now), he was sent in command of 400,000 troops to contain the Kabane. They had great initial success, but the shogun stopped sending supplies, and they were slaughtered. Biba never forgave his father and now wants revenge. That night, the Koutetsujou’s bushi meet with Ikoma and hammer out their plan. Kibito is leading the bushi; we haven’t see Kurusu since he plunged off the cliff in the last episode. They plan to take the keys that Ikoma’s been observing and fight their way to the engine room. Once they hold it, they think Biba will have to negotiate. Takumi asks if Ikoma thinks Mumei will come over to their side. Ikoma answers it doesn’t matter; he’s going to bring her over whether she likes it or not. Takumi shows how well he knows Ikoma when he asks if Mumei reminds him of his dead sister. Ikoma tries to shrug it off, but it’s clear Takumi’s right. Mumei confronts one of the white-robed men as she tries to find out who turned Horobi into a fused colony. They all deny it; but then Mumei sees the man whose arm Warabi cut off. She’s horrified. She confronts Biba as he’s contemplating the pulsating blue/white heart. He deflects her question by talking about how the Kabane appeared out of nowhere and showed him who his true enemy was. Mumei recoils, not able to understand him or where he’s going. He appears to relent, saying that since she likes the crew of the Koutetsujou, he’ll send word they’re not to be harmed as long as they remain peaceful. She happily runs off while Biba plans to make significant adjustments to her. When the captors bring food and began sorting people for blood “donations,” Takumi and the other steam smiths open steam relief valves to flood the compartment. The Koutetsujou’s bushi attack. Ikoma steals the keys. Takumi’s about to bash Sukari in the head with a pipe when Ikoma intervenes, saying that Sukari has been feeding them information the whole time. He was never on Biba’s side. Yukina hit him on the head anyway for making her angry. Yukina was not happy that Sukari pretended to be on Biba’s side, even if it was necessary. So she smacked him on the head. Capture from the Amazon Prime Stream. Warabi arrives with the same knife he used to hack the husband’s arm off. Ikoma’s easily able to knock him into the wall, but the Hunter picks up a pistol and takes aim. Takumi smashes him over the head with a pipe. The crew of the Koutetsujou begin moving forward over the tops of the cars. The stolen keys open the first set of doors to the Kokujou’s bushi. While they fight, Biba, still in the chamber with the pulsating heart, receives word of the uprising. He asks Mumei to lead the effort to shut it down. He says he’ll give the order to stop giving her medication (presumably to keep her from turning into a Kabane) if she refuses. She declines and bolts, shrugging free of the white-robed men as they try to administer a tranquilizer. She’s able to defeat several more captors before Biba’s right-hand man (the blonde haired man with a mustache) strikes her from behind. Her heart begins to glow, and she panics. Biba’s menu tranquilize her and make her susceptible to his suggestions. The captors have slowed the captive’s advance, so Kibito tell Ikoma and Takumi to go on ahead while they keep the enemy busy. Takumi wants to wrap things up so they can get something to eat. That’s when Ikoma finds out his keys won’t work on the last car. They try to get in another way but end up trapped in a dead end by Biba, Uryuu, Biba’s right-hand man (the one with a mustache), and others. Biba had anticipated the uprising tonight and had withheld the last key Ikoma needed. Biba fires at Ikoma’s heart, but Takumi throws himself in front of the bullet. Takumi says he’s glad he had the courage to take the bullet this time, unlike the day Ikoma got blown out of train earlier in the series. Ikoma’s not a solider. He’s a steam smith. He never trained to handle the death of a comrade, so he looses control and rushes headlong at Biba. Biba’s mustached right-hand man enjoys beating Ikoma for a while, then knocks Ikoma into the levers that open the train car’s side. Ikoma again rushes at Biba. The mustached man uses a rifle and blows off Ikoma’s right hand; the river stone had always carries bounced free and came to rest near Takumi. Uryuu brings Mumei into the car. Biba orders her to kill Ikoma. Clearly drugged out of her mind, she lunges and plunges a knife into his abdomen. Ikoma crumples, tumbles out of the train, and falls into the ocean below. Biba praises her. Mumei stares blankly down at the river stone, now held in Takumi’s dead palm. Uryuu’s clearly disgusted at Warabi’s behavior, but he doesn’t intervene. Capture from the Amazon Prime Stream. Interestingly, Biba offers no direct evidence that his father was to blame for cutting off the supplies. What if it were a lower-ranking official with his own agenda? What if the supply shipments ran into unforeseen problems? 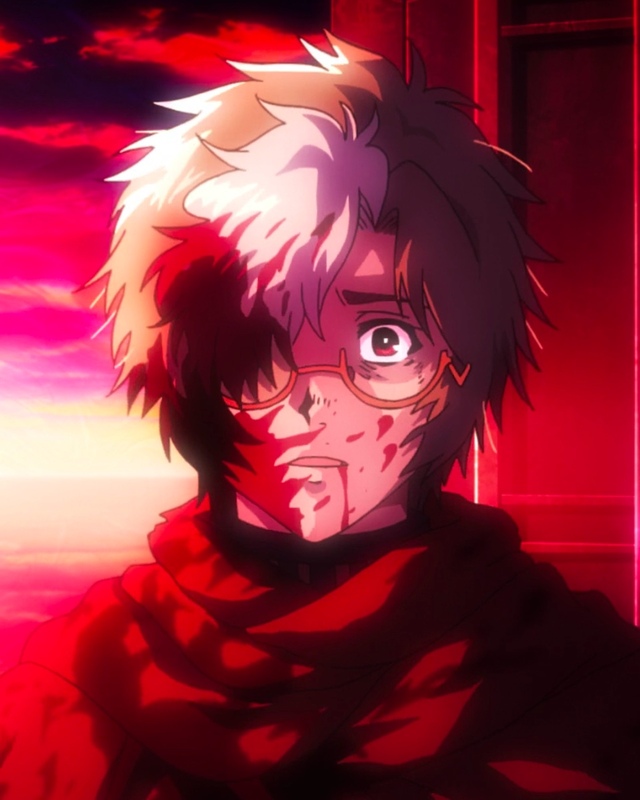 The shogun’s the likely explanation, but I think it’d be interesting if Kabaneri was trying to setup a dramatic reveal where Biba realizes his whole life’s a lie! That might be too much, but it wouldn’t be entirely out of character given his monomaniacal exclusion of facts that he doesn’t like. Ikoma carefully observed the captor’s schedule; he noted when the man with the keys showed up. He theorized that the man had keys to take the “donated” blood to the front car to feed the Kabane restrained there. His method was solid, and the plan he, Kibito, and the others made looked like it would work. Regardless of what happened, I think they made a solid, realistic effort. Even from early in the series, Takumi and Ikoma have shared a realistic and enduring friendship. 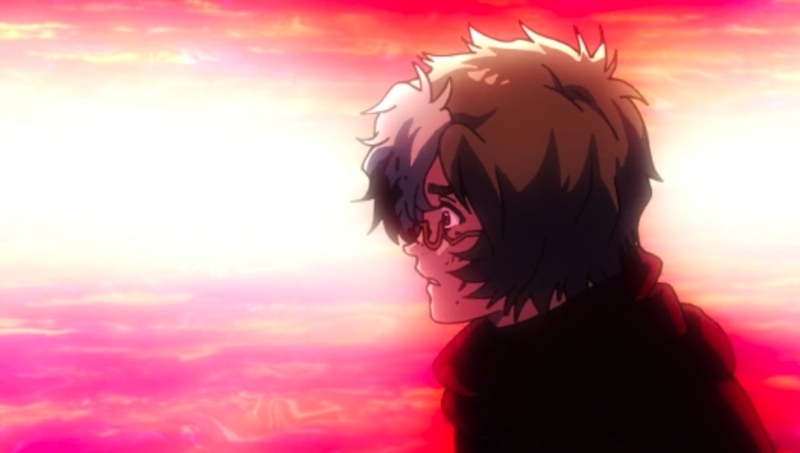 In this episode, when Takumi asks if Mumei reminds Ikoma of his deceased sister, Ikoma asks him not to compare his sister with “that brute” (i.e., Mumei). Yet, it’s clear that Ikoma does indeed think of Mumei as his sister — and perhaps as a chance to redeem himself in the eyes of history. This time, instead of running away in fear, he intends to save Mumei, whether she likes it or not. Sukari showed a courage I didn’t expect from him in this episode. He pretended to be on Biba’s side, saying it was because he followed whoever had bigger guns; but the whole time, he was feeding information to Ikoma. Seeing Yukina’s expression of disgust early in the episode had to be really hard on Sukari. He knew what he was doing was necessary, and he obviously cares for her; but he had to maintain the pretense or he couldn’t get good intelligence. Cool character! The disgusting and despicable Biba asks Mumei to attack her old friends, saying that she needs to be strong and besides, she doesn’t want to end up like her mother, does she? Okay, that’s not the part I liked — the part I liked is when Mumei says no. A few episodes ago, she would have done anything for Biba. Now, after encountering Ikoma, Ayame, and the others, and after seeing Biba’s actions in a new light, she’s ready to start breaking free. Of course, it remains to be seen if she has the strength and opportunity. In this scene, she made a commendable start. Mumei paid a high price for trying to break free of her brother’s influence. Capture from the Amazon Prime Stream. I was wondering how Biba was going to contain Mumei if she turned on him. Seems he had anticipated her betrayal (or at least allowed for its possibility) by lowering the amount of blood he gave her. While I hate the effect it had on Mumei, I have to commend him for his foresight! The last name she called out before she lost control of her will? Ikoma. Seems he made quite the impression on her. At the very least, Biba’s no an idiot. By anticipating Ikoma’s timing and with holding the last key, Biba showed that he was tactically aware. I like a villain who can cover the basics. So Takumi had felt guilty all this time for not trying to take the shot that blew Ikoma off the Koutetsujou in the second episode. I love how Kabaneri portrayed Ikoma and Takumi’s friendship. I hated to see it come to this end. Biba lived through the episode. Can’t say I’m a fan of that development! Ikoma fought hard, but he’s not a soldier. He’s a steam smith. Cinematic fight scene, though. Capture from the Amazon Prime Stream. Seriously, I feel frustrated that Ikoma’s combat skills aren’t improving more quickly. He’s able to take out mid-level baddies, but when it comes to level bosses like the mustached man, he stumbles. If I’m honest with myself, I have to admit that he’s a steam smith, not a soldier; and I have to accept that he’s getting better at a realistic clip. But seeing him get so torn up this episode was really painful! What I’m really saying is that I don’t like the emotional pain of characters I care about getting hurt. That being said, I have to think that Ikoma’s Kabaneri strength should have had more impact. Maybe it’s because he was kept nearly starved while in the cage? Maybe he’s still learning how to harness his power? I hope we get a chance to find out! I thought I didn’t like Biba before. Amazing how giving a demagogue a little bit of time and encouragement will help them blossom into a full fledged plague on mankind! Biba played his hand well in this episode. He anticipated Ikoma’s moves and countered them. I have no criticism for Ikoma. He, Kibito, Takumi, and the others came up with a solid plan that had a decent chance of success. They happened to have the bad fortune of going up against a paranoid demagogue who used to be a military general. I wouldn’t be surprised if his education had included classical combat strategies and tactics. So, our heroes chances of success weren’t great to start with. The terrible shock in Ikoma’s eyes, followed by the silent descent and faint slash as he hit the water — dramatic and effective. Capture from the Amazon Prime Stream. It looks like Mumei’s blade struck low. I hope that some part of her will remained under her control, and that she missed Ikoma’s heart cage on purpose. If Biba has a weak spot, it’s that he believes too much in himself. He doesn’t understand Murphy’s Law (or Crow’s Law, which is “It doesn’t matter if it can go wrong or not; it will anyway;” the universe is perversely creative…). Now that he thinks he has Mumei under control, he might relax his watch on her. I wonder what the river stone’s significance will be? It was important enough to Takumi that he used his last strength to hold it. Sentimental value? Catalyst for Ikoma’s transformation? I also wonder what Ayame’s going to do. Biba’s clearly not going to treat her crew well now. Does that mean he’s lost her bargaining chip with her? Will Kurusu return (if he survived the fall) and tilt the balance of power? One two episodes left this season. Here’s hoping one of them will be Biba’s last! Kotobukiya’s Rory Mercury Figure – As Awesome as Rory Herself!